… and with all the theropod thwacking, there goes the last of my ideas for the fighting apatosaurs challenge. It’s all very pretty, though. I’ve greatly enjoyed this series of posts and I’m looking forward to #7 in the future, whether I get a look-in or not. God I wish I could draw. If I could draw then I could draw rearing pink diplodocids with implausible alien neck display frills. Paul, the only possible response to “I wish I could draw” is “Then draw!” People like Brian and Bob weren’t born as artists, they practiced and learned until they got that way. There is no shame in drawing bad pictures, and doing so repeatedly is probably the one way to ever reach the point of drawing good ones. If you want to draw then I recommend [Drawing on the Right Side of the Brain]. It’ll teach you everything you really need to know — just one single book. It works. It teaches you NOT to draw but to take photographic images from your mind and transfer them to paper etc. When I started at chapter – 1, I couldn’t draw a human face. When I was 1/2 way through the book, I could cover a piece of paper with charcoal and produce exquisite human portaiture using only an erasor. That’s because there are no lines to draw in Nature … only light and shade. It’s a hard habit to kick but once you do, you won’t see the world the same way again. And that’s the point of the book. DON’T TRY TO DRAW !!! On the apatosaurs, Art needs to push the boundaries just like Science. It allows a bigger more complete picture for retrospection. Thanks for the recommendation, dale. I just bought a second-hand copy for 1p (plus £2.80 postage). You’re right, of course, that getting stuck in is the way forward. The bit I struggle with is the “take photographic images from your mind”. Like this guy – though nowhere near as extreme – I have trouble looking at an object and retaining an image of it in my head. 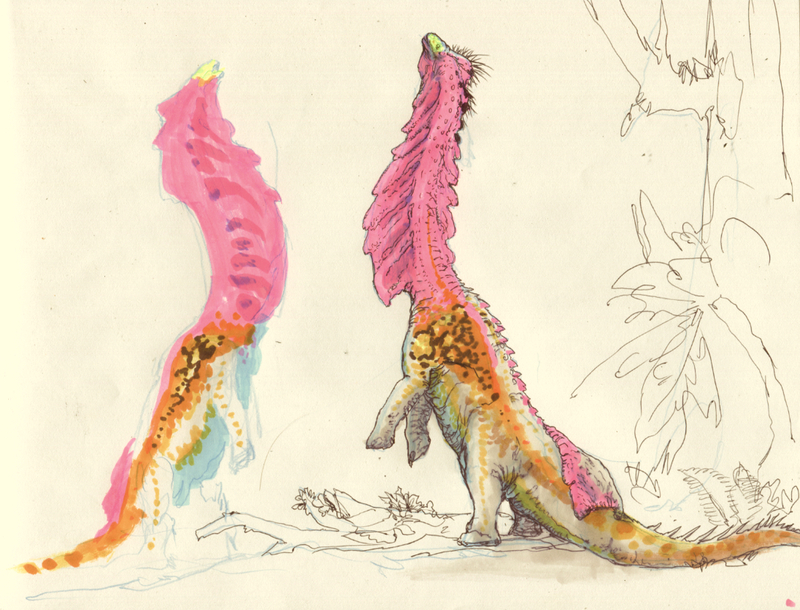 Still, a bright pink sauropod is enough of an inspiration for me to give it a go and that book looks fun. For me, all improvement in drawing ability has come from putting something on the page, looking at it, and then trying to figure out what’s wrong with it and how to correct it. It is the specificity of, and tenacious adherence to that analytic process, as well as the individual artist’s definition of “wrong” that separates artists in ability and style. Case in point: while I still like the idea of pink wattle necked diplodocids, I realized while making the above sketch that the overall perspective of the drawing failed to make them look big and towering, and that I had accidentally made the torso of the one on the right look saggy and deflated. When working in pen you can’t erase or rework, so I abandoned the sketch. Despite being a failure as a finished piece, it still served some very important purposes: 1) preliminarily explore the general visual effect of a pink super-wattle-necked rearing diplodocid and 2) communicate the basic idea to my collaborators for the purpose of exploring similar ideas in future pieces (such as Apatosaur neck smashing). So remember as you bash your head repeatedly into a thousand tiny obstacles that even if the drawings you make are totally awful to look at as pieces of art, they may still be useful, even if only to start your campfire. Seeing as how Apatosaurines were desgined for rigorous neck combat, could other Sauropods have fought with their necks? Also, is it possible that the inflatable neck sac and/or the porcupine neck could have been possible in Diplodocines/other non Apatosaurine Sauropods? 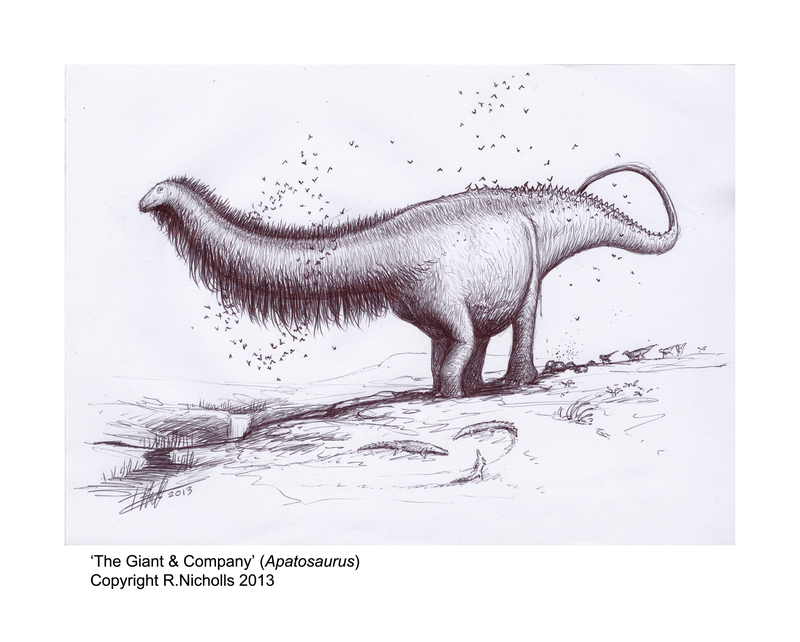 I think neck-based combat in other sauropods was possible, but nothing else optimised for it like apatosaurines did. It’s like the difference between peacocks and other birds. Most birds display their tail feathers, but peacocks went all out for it. I wouldn’t discount inflatable neck sacs, in fact I think It’s unlikely that sauropods evolved >150 genera across 150 million years on seven continents without some species evolving inflatable sacs. The porcupine thing, though, I don’t know. The combination of the inflatable sac together with the spikes seems like an unhappy marriage. I love the idea of feathers on non-bird Ornithodirans in general, but feathers on Sauropodomorphs almost gives me shivers due to how regal and original it makes them look. Do you think that this piece by Robert N. is plausible for such a large animal? I know that feathers can both heat and cool an animal, but I don’t know if that would be to effective for a whale sized animal, so I was just wondering if it wouldn’t be to “laughable” and/or unlikely for large feather displays on Sauropods. Thanks. Matt actually discussed the bearded apatosaur artwork here. I certainly don’t see any intrinsic problem in protofeathers (not flight feathers) on sauropods, though we have to admit that the absence of evidence so far does constitute gradually growing evidence of absence. 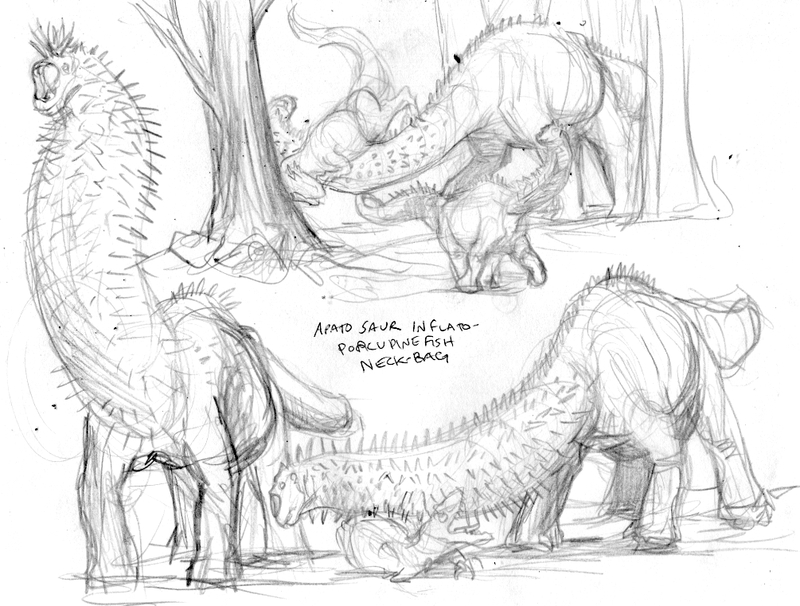 That said, if we’re right about apatosaur necks being used in combat, then having them also be feather-bearing display structures might be less likely. Thanks for the feedback Mike. Have a nice day ^^.